May 22, 2009. – The Mississippi band BEFORE NINE signs a management deal with Show Media Group and the world famous Joe Gingerella as the band gears up to showcase for multiple major record Labels. Joe Gingerella was named as one of the top 100 most influential people in the music industry , having worked with such bands as Sevendust, Korn, Slayer, Alien Ant Farm, Travis Barker Manntis, Jet Black Stare, Divide The Day, Atomic Outlaws , just to name a few. The Show Media plans to begin showcasing Before Nine to major record labels & to have the band begin touring just in time for summer. 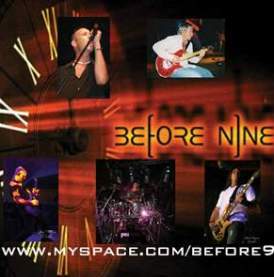 Joe Gingerella says The Band ‘Before Nine’ is one of the most powerful new groups I have ever heard, with amazing lead vocals and three part harmonies that cut like a razor blade the bands songs are ready to take active rock radio stations by storm. SMG & Joe Gingerella have been promoting, producing and managing bands since 1979 all over the country with a track record of success stories spanning decades. In 1996 Joe Gingerella moved from Southern California to Seattle Washington and started the award winning music television show called SQUEEZE TV that was seen in over 5 million homes weekly & featured national bands and extreme sports. In 2009 Joe Gingerella made history as the first manager to have twelve of his artists to perform during SXSW in Austin, Texas and getting four of them major record deals. SMG is proud to announce that “Before Nine” is now managed by Joe Gingerella and we look forward to getting the band’s music heard on radio stations everywhere & to bring their live show to every city in the country. oh no….Not Joey G. good luck with that. What do you mean Chris. Please respond.I have questions and a nephew who has signed with Joey G for one year.Is he for real or what.